← Weakness pt2 – Some questions for you. I hope you are admiring this fine table, I hope you are appreciating it’s lines, it’s fine handmade details. I hope you love it as much as I do, but I’m not sure you could. It’s a table that was made by my excellent Dad in his teenage years. It’s a table that sat in my Grandparents conservatory getting old and sun-faded through time. It’s part of my childhood memories as every other Sunday afternoon we would go over to their house for tea and scones around it. When they died Dad took it back and until 2 and a half years ago it languished in my parent’s garage covered in dust and cobwebs. Unseen, out of sight, tucked away until it could be unveiled to the world again. It was kept in hope. It was kept in hope that my brother or I would eventually own our own homes and maybe one day it could have a new lease of life. We lived on, always in house shares that never quite justified the uncovering of the table. There was never quite enough room, never quite enough trust in other people not to ruin what it could become. Over time I declared it was mine. I’m not sure when that happened. I presumed my deep unfathomable emotions about the table, a connection to the soul of my father, overruled my brother’s and I declared in arrogant younger sister mode that it was mine. I had spoken first. I had dibs. It was still never quite the right time. The table was destined to sit covered with a sheet until the right time. I think only I knew when that was. It was when I would get married. I had no proof that this would ever happen. I had no hope that this would happen for many years. I gradually acquired some of the other things I thought were the reserve of married couples; picnic blankets and a bread maker. I lived my life well. But I refused to embrace the table into my single life. Even when challenged just to take it and use it I said no. Somewhere deep inside me was an emotion I barely understood. Hope. This was a table of hope. Then about 3 years ago hope was stirred into a strange new reality. I was with someone. We would get married. There was promise of new life for the table. After I’d said yes please to husbandface’s very lovely request of a life together I phoned my Dad and asked him to get working on the table. He sanded it down, polished it, worked on his teenage project once more and I felt, yet again, that strange connection to his past. The table entered our new little flat, shiny and new. We ate around it, welcomed friends to it and enjoyed it’s beauty in our lives. 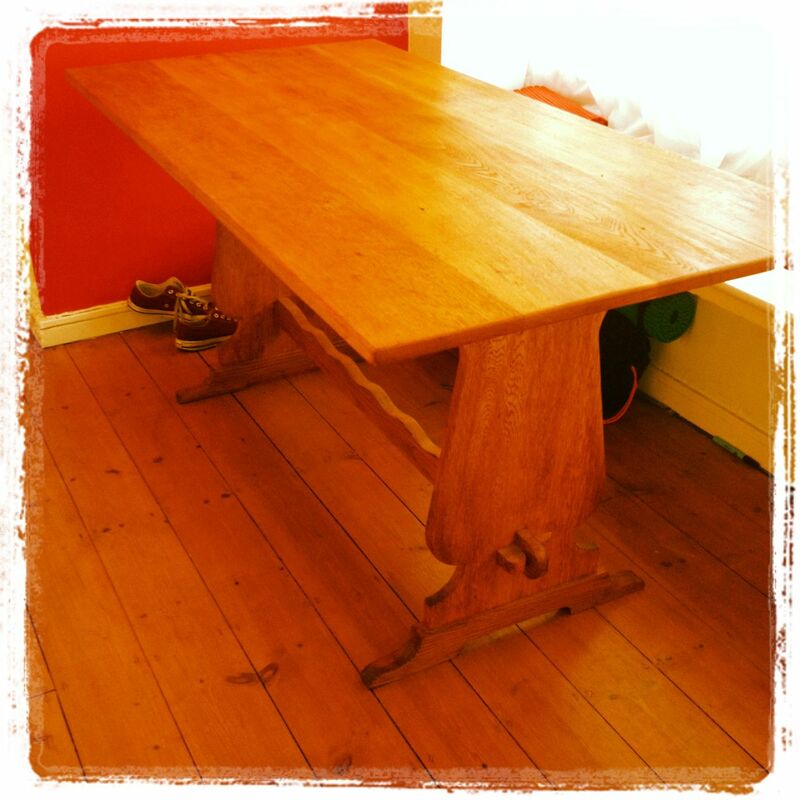 The table is now heading to pastures new. When we moved into our new flat it couldn’t fit into the kitchen to be usable. When we moved here it lived in our giant corridor between the rooms. Occasionally we sat around it, special meals and New Year celebrations were enjoyed around it. Sadly though it’s become a bit more of a storage table for all the random objects in our life. Having to move furniture around this summer for the impending arrival of our small squirmy baby has coincided with the return of my lovely brother and his family from Canada. They need a table. We don’t anymore. We need the space. And so it is with some sadness that I’ll be bidding farewell to the table for the time being. Who knows when or if it will return. Until then I’m glad it’s going to a good home, to a brother who loves it as much as I do, but in a different way, to a family who can create more memories and joy sat around it sharing their lives with each other and those around them. It’s one of those things that should always be in our family. One of those rare objects that connects us to a world bigger than us, that sums up a past, present and future. I love it and all it has experienced over the years. Here’s to more to come. 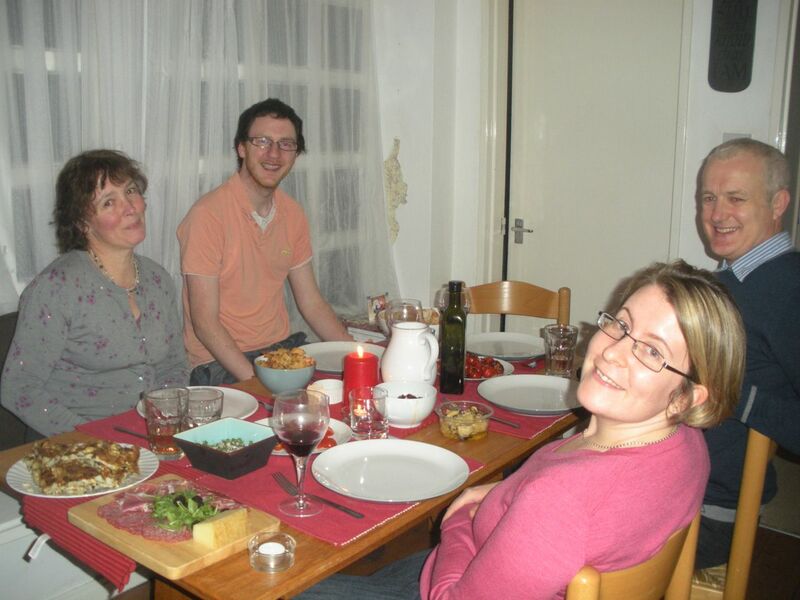 This entry was posted in Life on the journey and tagged brother, Dad, family, husbandface, table. Bookmark the permalink. Thanks for this, Kath, it struck a deep chord in me. I love the fact we have items of furniture which we remember from our parents houses. Not of much cash value, but things that connect us to our families. That’s what I dislike about these makeover programmes on TV, that they consign so much into a fleet of skips. I’ve already chosen the ‘4 pieces that speak of home’ that I intend to have with me all my days, even if I finish my life in a care home. A bookcase my dad made for me when I was 11, the small gate legged table that belonged to Colin’s grannie, my sewing box and my dressing table -the first nice new piece of furniture we saved up for (though it may be too big for a care home room!). All of them will remind me of different aspects of my life. And you’re right to make space – small wriggly babies grow quickly, but seem to need a lot of stuff at every stage. It’s worth the (temporary?) sacrifice of some loved items to make room in your home, as well as your heart, for this already much loved new person.